For the past two weeks we have had nine students from Korea at the Anaheim Hills campus. These third and fourth graders have come here for an English Immersion Program. They attend English school in Korea on Saturdays and we were so surprised to hear how wonderfully they spoke English! They learned about American culture with their specialized teacher and tutor during their visit. They lived with parents from our school during the two weeks and learned about the American family dynamic! During their visit they visited Sea World and Disneyland and thoroughly enjoyed spending time on our campus. 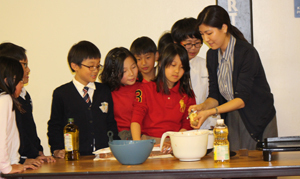 On Tuesday they absolutely delighted us with a presentation about Korean cooking and traditions. Each student stood up and spoke in perfect English about Kimchi and Jung, how to make it, and the importance of it in Korean culture! At their school in Korea they have a large garden and grow many vegetables and herbs. They had grown the cabbage for the Kimchi and prepared it at home in Korea and then transported it over to the US for their cooking demonstration. While they have been visiting us, the students have had lunch and PE with our Fairmont students to get to know them. It has been a wonderful experience for everyone. On Wednesday they visited Mrs. Cornish's fourth grade classroom while she taught a science lesson about circuits. It was so fantastic to see them making circuits afterwards. They were all so proud when the lights on their circuits lit up!